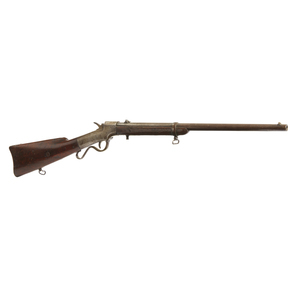 Jenks "Mule-Ear" Navy carbine, dated 1845, manufactured by N.P. Ames, Chicopee Massachusetts, in very good condition with brass mounts. 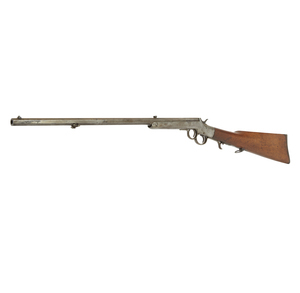 Breech loading with the "mule ear" side hammer. Markings are crisp and clear. 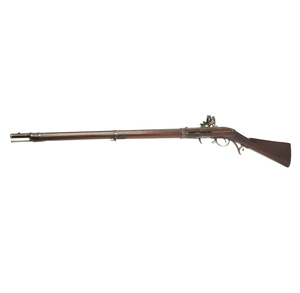 42 inches long overall Processing and shipping within the continental U.S. $55.00 plus 1.5% replacement cost insurance. 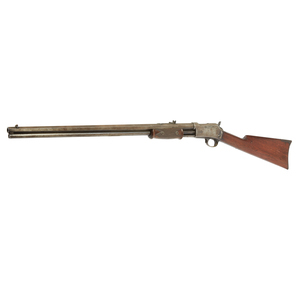 Colt Lightning Pump Action rifle with octagonal barrel in .44 W.C.F. caliber. 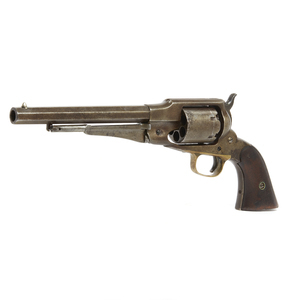 A very nice Colt Lightening rifle in .44 W.C.F. with checkered pump grip. Action is very tight and slightly sticky. 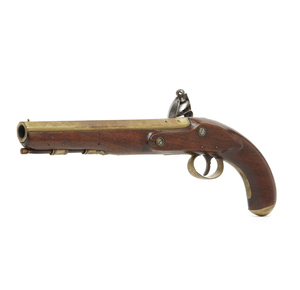 Gun retains some traces of blue, but is overall brown. 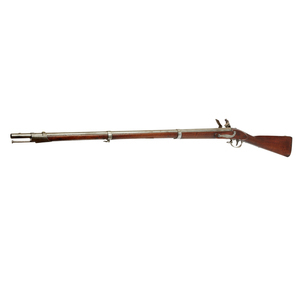 Dimensions: 46"l overall. Processing and shipping within the continental U.S. $55.00 plus 1.5% replacement cost insurance. 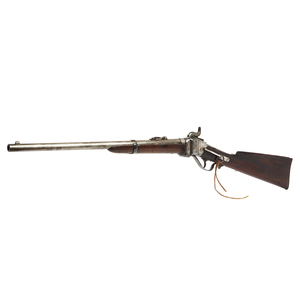 Smith Civil War cavalry carbine in .50 caliber. 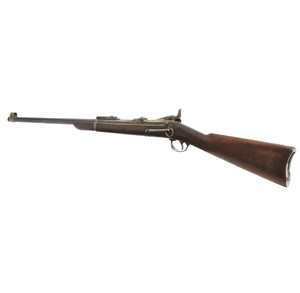 A nice Smith Civil War carbine in good condition with tight action, nice stock. Dimensions: 40"l overall. Processing and shipping within the continental U.S. $55.00 plus 1.5% replacement cost insurance. 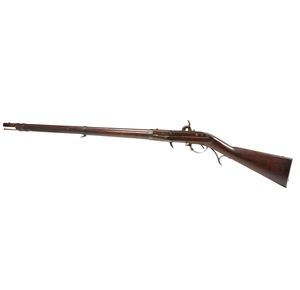 A very fine example of the Hall Flintlock rifle, manufactured at the Harpers Ferry arsenal, with date of 1838, retaining much original brown finish. Possibly refinished. 52 inches long overall. Processing and shipping within the continental U.S. $105.00 plus 1.5% replacement cost insurance. 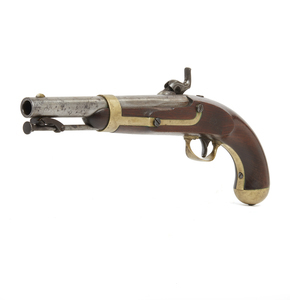 An 1835 dated Springfield Flintlock musket with extremely crisp markings and clear cartouches on stock. It may be a re-conversion, as touch hole has been re-bushed. 57.5 inches long overall. Processing and shipping within the continental U.S. $105.00 plus 1.5% replacement cost insurance. 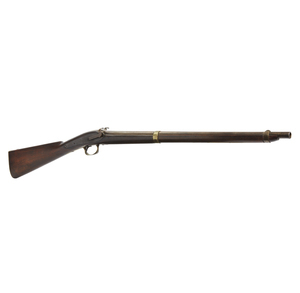 Sharps and Hankins Civil War Navy carbine with leather covered barrel. 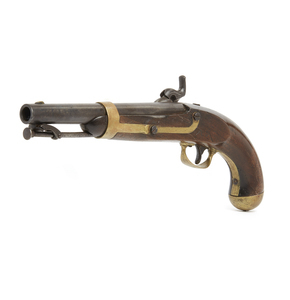 A very nice Sharp and Hankins with complete leather barrel cover. .52 caliber. Rear sight is missing. Dimensions: 40"l overall. Processing and shipping within the continental U.S. $55.00 plus 1.5% replacement cost insurance. 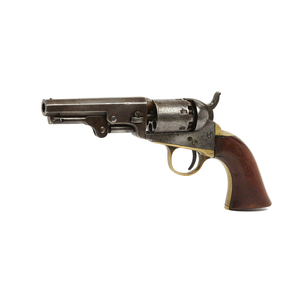 Colt Bisley single action revolver in .38 W.C.F. with 4.75" barrel. 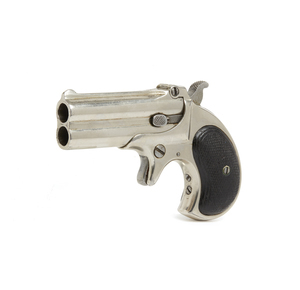 A very nice Bisley serial number 303255, blue finish, hard rubber grips in .38 W.C.F., with a 4.75 inch barrel. 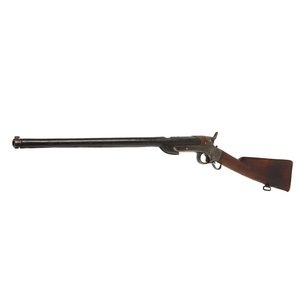 Dimensions: 4.75" barrel, 10.25" overall. Must be shipped through F.F.L. 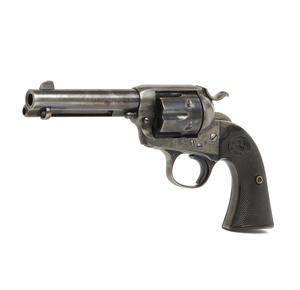 Colt 1862 Police Revolver in excellent condition with much blue and case hardening. 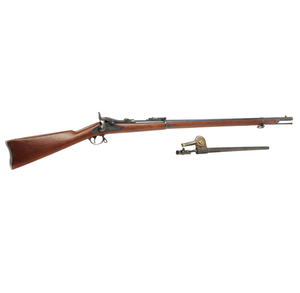 5 inch barrel, serial number 1507, early production, made in 1861. Processing and shipping within the continental U.S. $25.00 plus 1.5% replacement cost insurance. 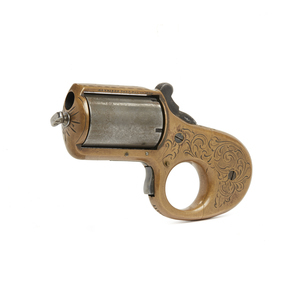 This brass framed .32 caliber Reid "My Friend" revolver is beautifully engraved, with a tight, crisp action. Dimensions: 5"l overall. Processing and shipping within the continental U.S. $25.00 plus 1.5% replacement cost insurance. 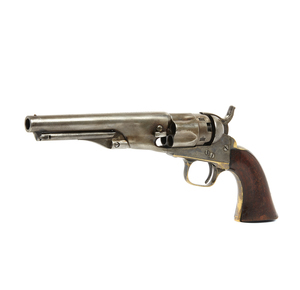 Colt 1877 "Thunderer" Sheriff's model revolver in .41 caliber. 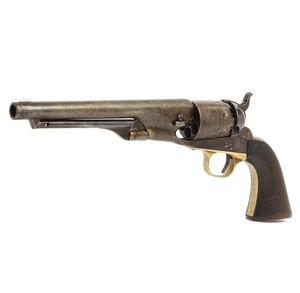 A beautiful Sheriff's model Colt 1877 "Thunderer" revolver, with beautiful checkered grips, retaining about 70% of its original blue finish. 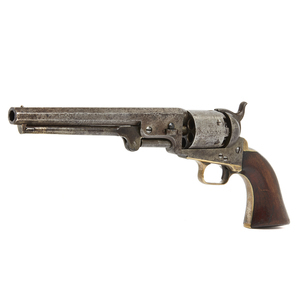 Serial number 26433, manufactured in 1880. Dimensions: 9"l overall. Processing and shipping within the continental U.S. $25.00 plus 1.5% replacement cost insurance. 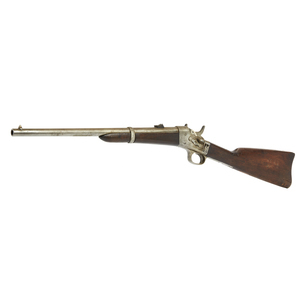 The most famous Civil War Cavalry Carbine, this is serial number 82938, still in percussion as issued during the War. 39.5 inches long overall. Processing and shipping within the continental U.S. $55.00 plus 1.5% replacement cost insurance. 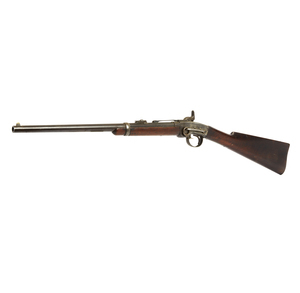 Remington Rolling Block carbine, model 1884, probably in .43 caliber. A very nice, bright finished Rolling Block saddle ring carbine. Dimensions: 37"l. Processing and shipping within the continental U.S. $55.00 plus 1.5% replacement cost insurance. 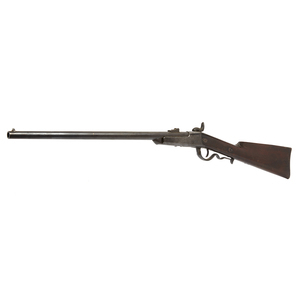 A very handsome model 1884 Trapdoor rifle in .45-.70 caliber. Possibly refinished, with excellent original bayonet and sheath. 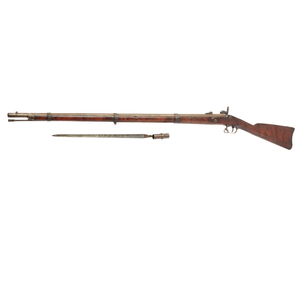 52 inches long overall without bayonet. Processing and shipping within the continental U.S. $105.00 plus 1.5% replacement cost insurance. 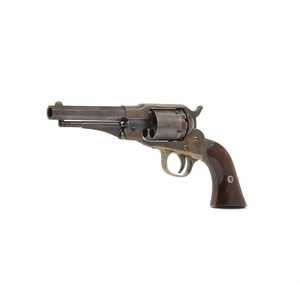 Colt 1860 Army revolver in .44 caliber. 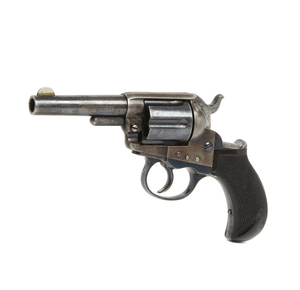 Serial number 93900, manufactured in 1863. Inspector's cartouche visible on left grip. Dimensions: 14.5"l overall. Processing and shipping within the continental U.S. $32.00 plus 1.5% replacement cost insurance. 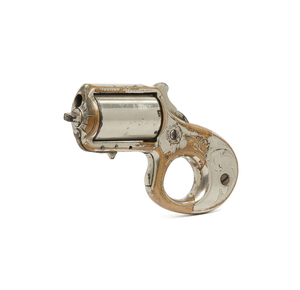 Reid "My Friend" knuckle duster revolver, engraved and nickel plated. 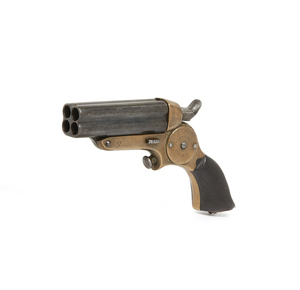 A very fine Reid "My Friend" knuckle duster revolver in .22 caliber, retaining most of its original nickel finish and with engraved frame. The hammer spur has been filed down for easier pocket carrying. Dimensions: 4.5"l. Processing and shipping within the continental U.S. $25.00 plus 1.5% replacement cost insurance.